My first real introduction to 3D Robotics (3DR) was by way of their IRIS+ drone. With its “Follow-Me” technology, pre-programmed flight missions, and ability to utilize a GoPro camera, the IRIS+ proved to be such a compelling package that I purchased one for myself. Although I had some flight experience with (much) more basic drones, I wasn’t truly prepared for everything the IRIS+ had to offer. To be honest, having so much access to flight and control settings could be quite intimidating to a fairly novice pilot. The IRIS+ is a good drone, but during my initial setup I found myself having to contact the (absolutely stellar) support team at 3DR to double-check system settings and configuration prior to my first flight. It is clear that I was not alone with these issues, based upon how they designed the new Solo platform. Powered by two 1GHz Linux computers and packed with a variety of automated flight control features, the Solo is as easy to use as a smartphone app. Unique from its competition, 3DR decided to make the make the Solo its lone prosumer offering, opting to build it upon a modular platform that can evolve with changes in use and technology. Needless to say, I now have a Solo sitting next to my IRIS+. Although I can go on about its ingenious programming, stable flight dynamics and overall ease of use, perhaps the best feature that the 3DR Solo has to offer is its HDMI port located in the rear of the controller. I know that an HDMI port doesn’t seem like a big deal, but to the team here at Stream Dudes- we saw a wealth of potential. For starters, that HDMI port feeds “clean,” live, HD video directly from the Solo and into your hands, without the need for any additional add-on equipment. This is important because it means that there is no need to worry about mounting and wiring a wireless transmitter onto the drone. The only additional equipment you (might) need would be located safely on the ground. Testing that theory, the team connected a micro HDMI to HDMI cable to the Solo’s controller and fed the signal into my vMix GO Plus via an Atomos Connect H2S HDMI to SDI converter- it worked incredibly well. Considering that we were using a GoPro Hero 3+, the image looked suitable for production use and led us to try a few other potential workflows. The next test was conducted using an Atomos Ninja 2, which would serve as a capture device capable of obtaining a ProRes recording as well as acting as a secondary monitor- it too worked well. 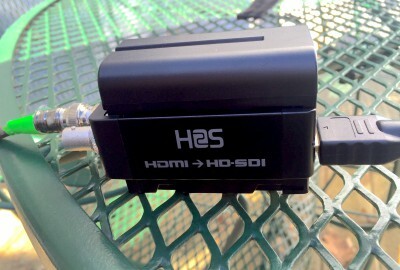 In fact, having the clean pass through on the Ninja along with the way that the Connect H2S can easily attach via the battery port, meant that an Atomos monitor can be used in conjunction with a switcher. Finally, we tried something very simple. 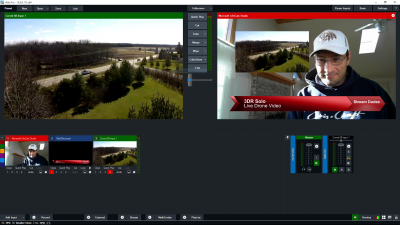 We connected a Teradek VidiU to the Solo’s controller and were able to easily stream our live footage out to UStream, making this workflow the easiest way TO stream live drone footage directly to the web. Due to its simplicity, we have a feeling that this might become the most popular workflow scenario we have tested, thus far. Considering its ease of operation, great support from 3DR, future enhancements, and added functionality provided by the HDMI port- we feel that the 3DR Solo should be a serious consideration for any producer. To make workflow integration even easier, we here at Stream Dudes have created several Solo Sets that are designed to address specific production goals. On behalf of the team, I encourage you to Contact Us with any questions you might have about the 3DR Solo- The World’s First Smart Drone.